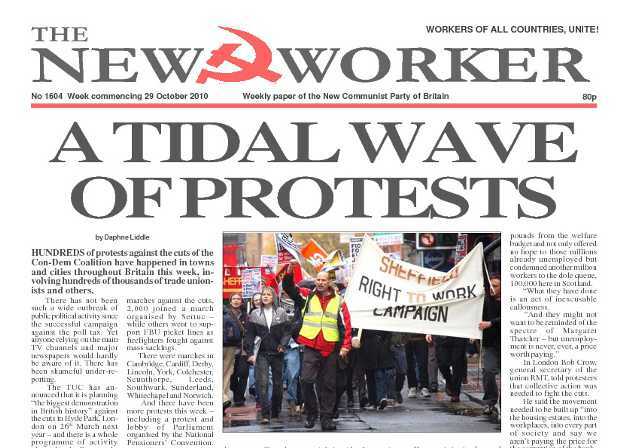 HUNDREDS of protests against the cuts of the Con-Dem Coalition have happened in towns and cities throughout Britain this week, involving hundreds of thousands of trade unionists and others. TARIQ AZIZ, Iraqi foreign minister in the deposed Saddam Hussein government, has been sentenced to death by a puppet regime court in Baghdad. Aziz, who comes from the Iraqi Christian community, was accused of responsibility in the deadly persecution of Shia Muslim leaders during the Saddam era. THE BOURGEOIS media constantly remind us of the wonders of the internet and information technology that has allegedly transformed our lives for the better. Twitter and other social networking services are hailed as forces for individual freedom of expression and valuable tools of “democracy” when they’re used to ferment reactionary trouble in Iran, Belarus and Ukraine. People’s China is denounced for imposing restrictions on Web access and Democratic Korea is labelled backward and repressive for only allowing a limited mobile phone network to operate in its territory. But it’s a different tune when the boot is on the other foot. When anonymous email is used to leak embarrassing documents; when the crimes of imperialism are exposed for all the world to see the internet becomes “irresponsible” and the most craven bourgeois pundits start calling for censorship, government control and the prosecution of those who have dared to break the ruling class consensus.